The Memorial Hall was originally erected in memory of those who served in World War One. The hall was rebuilt after a 1951 bushfire. LANGKOOP, Friday.— Although Langkoop is only five years old, there is not the slightest doubt that in the near future, it will be known throughout thr State as an important and prosperous township. The nearest Victorian railways at present are the Goroke line, 40 miles to the north, and the Casterton lino, 40 miles to the south. Langkoop district is unfortunate as regards transport facilities, but it is hoped that timo will remove this handicap. Lnngkoop's birth was due to the Government acquiring the Elderslie Estate of 36,000 acres, and converting it into a soldier settlement. Previously, this area was the pastoral home of a bachelor, employing half a dozen station hands. No time has been wasted by the new tenants, and today, the country is dotted with thirty-six prosperous looking homesteads, each surrounded by the usual improve ments, and occupied with a hard-working family. 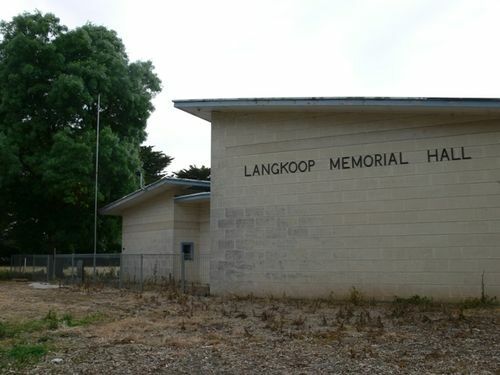 These people are accepting Langkoop as their centre, and already it is showing the embryo form of a township, there is a post and telegraph office, with a telephone lino connected with Apsley; a general store, soldiers' memorial hall, in which a school is held, and a shearing shed. The hall was recently completed, at a cost of £600, and it is a fine structure. Funds are derived from an annual race meeting, which has been a huge success, both from a social and financial point of view. It now remains for the residents to make full use of the building. The shearing shed is owned and worked by syndicate of settlers. They supply most of the labor themselves, and the venturo appears to be very successful. Age (Melbourne), 5 June 1926.